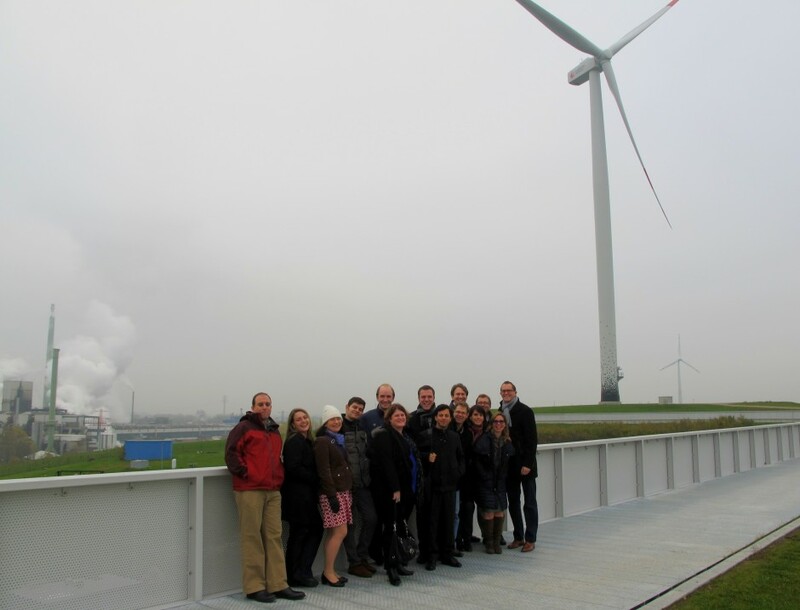 The Emerging Leaders in Environmental and Energy Policy (ELEEP) Network brings together young professionals from Europe and North America with the aim of fostering transatlantic relations. 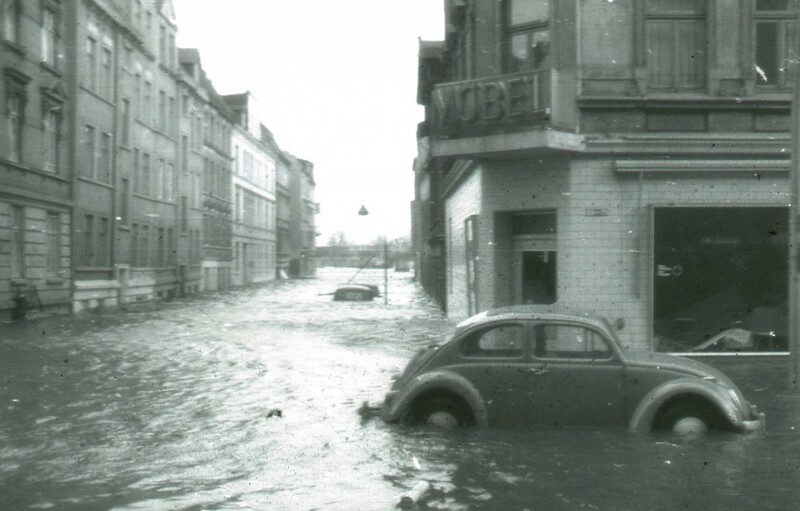 As Warsaw prepared to host last month’s UN climate convention (COP19), ELEEP members, including former EGU Science Communications Fellow Edvard Glücksman, sat down for coffee with one of the early pioneers of Poland’s green movement. 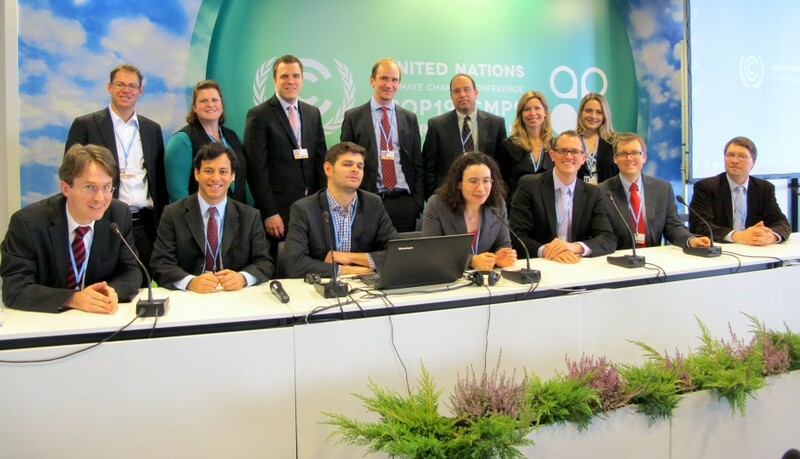 Last month, Poland hosted the COP19 UN climate talks amidst a flurry of controversy. One of the EU’s least energy-efficient countries, Poland remains staunchly committed to a future powered by coal and shale gas, presently deriving over 90% of its electricity from the most carbon-intensive of fuels. Polish politicians almost unanimously agree that coal, their ‘black gold’, is critical for the country’s future energy needs – and independence – as well as for the increasingly industrial developing world. They therefore believe that, rather than shifting to renewables, the most sensible next step is to focus on developing greener coal technology, including carbon capture and storage (CCS) and flue gas separation. However, not everyone shares the coal-centric view held by Poland’s political leadership. According to veteran green campaigner Andrzej Kassenberg, president of the Institute for Sustainable Development, continuing to rely on coal would be a big mistake. 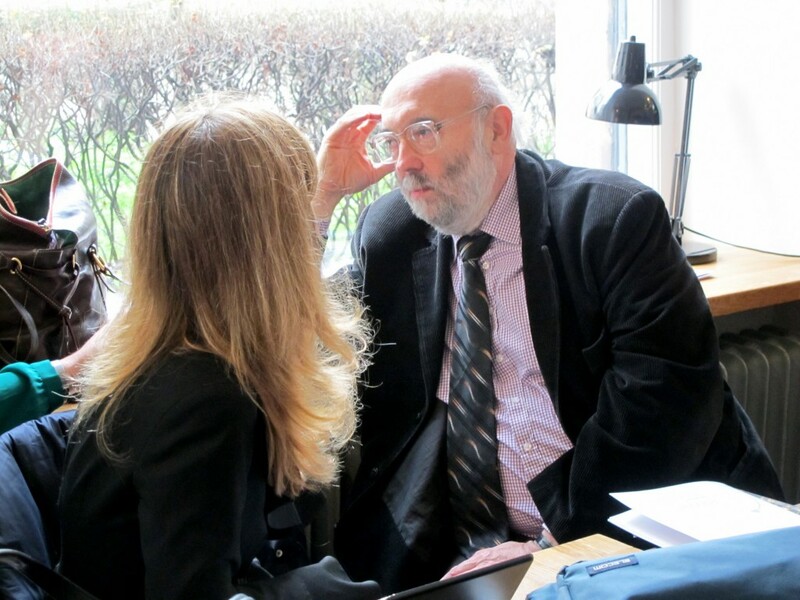 Yet, in a bustling coffee shop at the heart of Warsaw, Kassenberg speaks with cautious optimism about his country’s future and the prospect of significantly lowering emissions, even within neighbour Germany’s ambitious 2050-timeframe. To that end, his recently published evidence-based report, 2050.pl – the journey to the low-emission future, thoroughly demonstrates how Poland can continue growing whilst also shedding its addiction to coal. Recounting his country’s energy story, Kassenberg describes the slow weathering of Polish infrastructure and its ageing fleet of power stations, neglected by generations of narrow-minded politicians keen to promote coal and nuclear quick-fixes. He fears that, should Poland continue to embrace fossil fuels, they too, like Spain, Portugal, and Greece, would fall into a “middle income trap”, their development grinding to a halt without the modern infrastructure needed to support growth. Other nations, he explains, like South Korea and Finland, avoided such a fate because they “decarbonised” before it was too late. When asked to summarise how Poland’s low-emissions future could work, Kassenberg is quick to suggest that a commitment to drastically overhauling the country’s energy portfolio, mirroring Germany’s ongoing energy transition, would improve almost every sector of Polish society, not least the population’s health. According to the European Environment Agency, Poland experiences the second highest levels of air pollution in Europe; citizens of major cities breathe in the pollution-equivalent to 2,500 cigarettes per year. Kassenberg maintains a discernible realism when he speaks about the future. He sees shale gas as a potentially effective transition fuel and one that could best be used on the local level by small-scale power stations, complemented by locally harvested renewables. However, he notes that shale has until now been largely neglected in Poland; at present, it gets no mention in the national energy policy agenda, perhaps because reserves lie deeper – and under a denser population – than in the United States. With such strong political support for coal, how, then, could one go about convincing members of the population to push politicians to go back on their word? According to Kassenberg, much of the challenge lies in understanding how power works in the old East. Democracy, he explains, does not work in Poland as it does in western Europe or North America, primarily because of a lack of basic knowledge and overly short-term planning. To that end, Kassenberg is convinced that policymakers overlook long-term challenges in favour of short-term, local issues and popular grievances, such as unemployment. Voters, in turn, think that energy from renewables would be expensive, failing to understand the high costs associated with a coal portfolio. Polish coal is naturally expensive to exploit, with reserves lying deep underground, making the mining process relatively costly and often more expensive than importing from mining areas that are further afield, such as South Africa. Furthermore, other hidden costs associated with deep-lying coal burden the taxpayer, not least in their subsidising of miners’ health benefits. In spite of vehement opposition from coal lobbyists, Kassenberg’s arguments provide at the very least a guiding framework through which Poland can cut back on its coal consumption. However, only time will tell whether two rollercoaster weeks in the international climate change spotlight will have compelled the nation’s leadership to reconsider their defiant approach and take action. 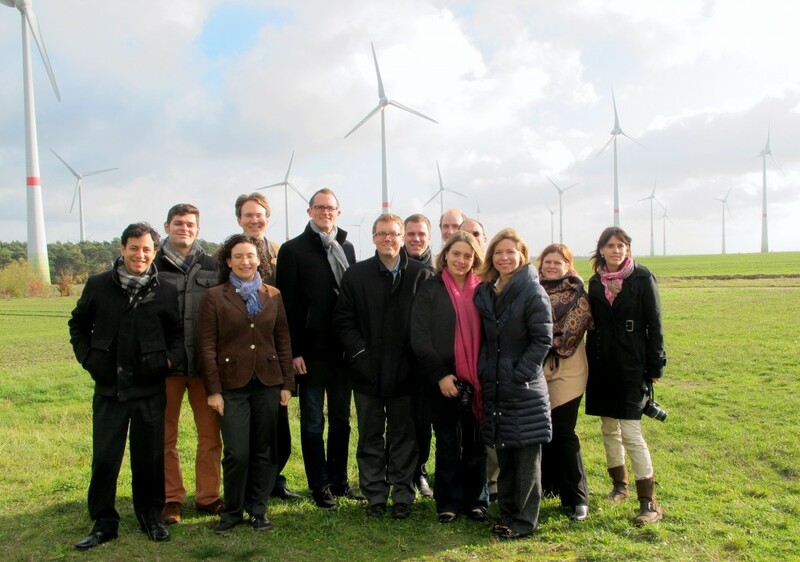 The Emerging Leaders in Environmental and Energy Policy (ELEEP) Network brings together young professionals from Europe and North America with the aim of fostering transatlantic relations. Former EGU Science Communications Fellow and ELEEP member Edvard Glücksman reports back from a recent study tour, where participants were shown first-hand how a rural German community has successfully achieved a break from the national energy grid and pledged its future to renewables. Renewables are set to play a vital role within the global energy portfolio of a low-carbon future. In parallel with this year’s UN climate change conference in Warsaw (COP19), which, earlier this month, proceeded cautiously and not without controversy, we explored a series of German prototype community projects built to demonstrate that modern life is indeed possible under conditions of minimal fossil fuel consumption, albeit on a local scale. We visited a house in Berlin capable of producing an energy surplus and a district of Hamburg made up entirely of eco-friendly housing prototypes. Yet, in my opinion, our most impressive visit was to the remote village of Feldheim (with a population of 128 people), located in the district of Treuenbrietzen, about 80 km southwest of Berlin. On the spectrum of climate-friendly projects, Feldheim represents an extreme outlier as a microcosm showcase of a zero-emissions future: it is Germany’s first and only energy self-sufficient community, a pioneering working example of economically beneficial renewable use. The Feldheim project dates back to 1995, when a local entrepreneur paid for the first wind turbines to be installed on nearby fields, the highest (and windiest) flat ground in the state of Brandenburg. Next, the village bought its own electricity grid, severing ties with the regional grid and the major national provider that operates it. This vital transition required a steep initial investment of €2.2 million, financed through one-off connection fees paid by local homeowners together with subsidies of €850,000 provided by the German government and European Union. Finally, the village forged links both with local power firm Energiequelle GmbH, which agreed to install a fleet of wind turbines in return for the right to sell excess power back on the market, and with a regional agricultural cooperative, which put up over 350 hectares of land to grow corn required for biogas. Feldheim derives its electricity and heating from three main sources. Firstly, a 43-turbine wind farm, with a total installed electrical capacity of 74.1 MW, generates 129 million kWh of electricity per year, or enough to power nearly 7,000 UK homes. Simultaneously, a biogas plant (500 kW), operated by the local agricultural cooperative, generates 4 million kWh of electricity per year (enough to power just over 200 UK homes) from an input of manure, corn, and whole grain cereal. Electricity from the biogas plant is sold on the public market, but the heat produced during power generation is fed into a separately-installed heating grid, which heats the village’s private homes, commercial enterprises, and livestock enclosures. Finally, on particularly cold days, additional heating is supplied through a 400 kW woodchip furnace, though we were assured that its prolonged use is relatively rare and that all wood is collected locally and in a sustainable manner (using branches only). This three-pronged approach affords Feldheim an existence free of fossil fuels, something its inhabitants are visibly proud of. 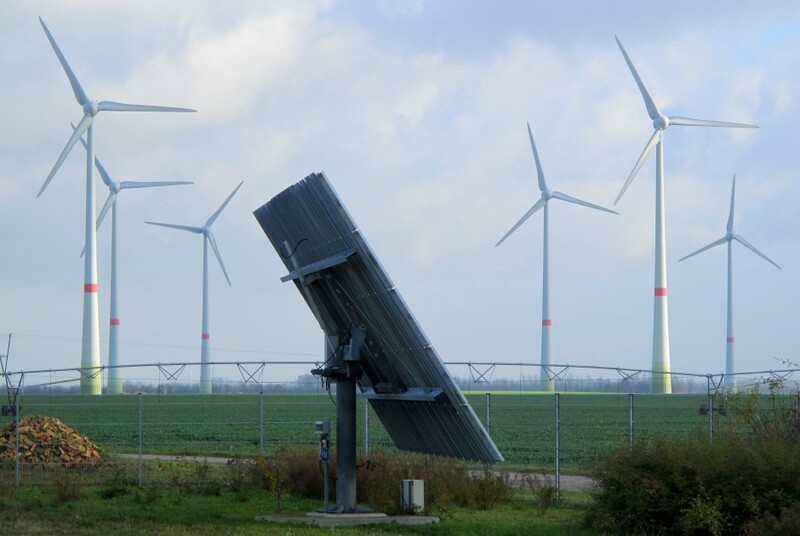 However, perhaps more important from a global perspective, and certainly what has raised most eyebrows in Germany and internationally, is that the project clearly demonstrates that renewable energy investments can have tangible long-term economic benefits. Feldheim consumes under 1% of the electricity produced annually by its wind turbines, selling the remainder back on the market; the process lowers local electricity bills to around half (16.6 cents per kWh) of the national average and to around the same level as in Poland, where over 90% of electricity is generated using carbon-intensive coal-fired plants. At the same time, also selling its electricity back to the market as well as supplying the entire community with heating, the village’s biogas plant saves the inhabitants of Feldheim over 160,000 litres of heating oil each year. 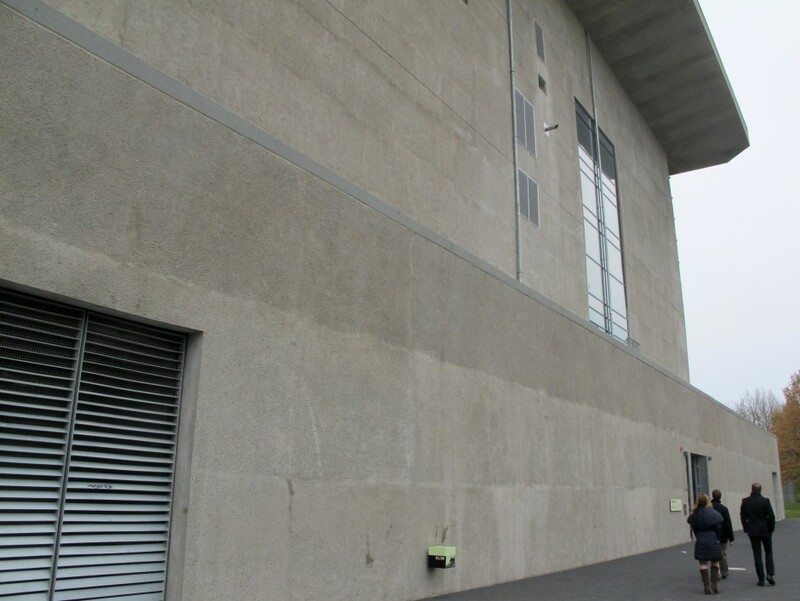 It is set to break even on the initial investment of €1.75 million towards the building of the plant within a decade. Having understood the economic potential of renewables, Feldheim took yet another pioneering step when, in 2008, it constructed a solar farm comprising 284 panels. 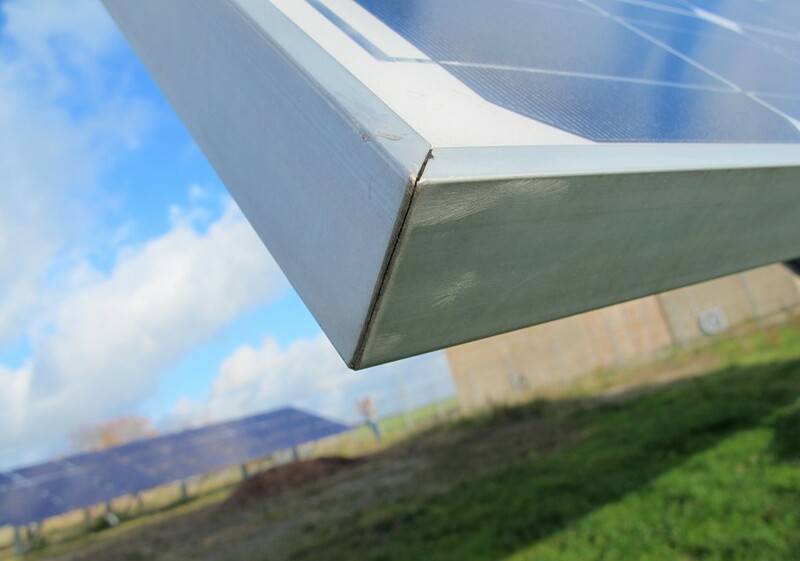 The installation produces a total annual output of 2,748 mWh, or enough to cover the annual power requirements of around 600 four-person households. The construction of the panels, which sit on trackers that tilt horizontally and vertically, has also created 20 local jobs and rejuvenated the 45-hectare area of Selterhof, a former Soviet telecommunications centre dismantled and restored to its natural state as a result of the project. Understandably, the small population of Feldheim is optimistic about the nation’s renewable energy future and their enthusiasm seems to be catching on. In the cash-strapped state of Brandenburg, where other villages suffer 30% or higher unemployment rates, every single resident of Feldheim is employed, mostly working at one of the renewables sites. The community continues to plan for the future, the next step being the installation of a lithium storage battery by the end of 2014. The battery will provide enough electricity to supply the village for up to four days, in the unlikely scenario that wind levels drop for a sustained period of time. Yet, Feldheim remains just a small piece in the wider context of Germany’s energy transition (‘Energiewende’), announced in June 2011 by Chancellor Angela Merkel’s government. In doing so, Merkel set the country on an incremental course to generate 80% of its power through renewable sources by 2050 at an estimated cost of €550 billion. At the same time, the EU’s most populous Member State, home to over 80 million people, continues to reduce its reliance on nuclear power, aiming to phase it out completely by 2022. COP19 protagonists Lord Stern and Christiana Figueres increasingly push their sense of urgency whilst negotiators continue to grapple with the mission of reaching a new international climate change agreement by 2015. Meanwhile, many of the planet’s most powerful nations struggle to see clearly how economic growth by way of fossil fuel consumption can be reconciled with climate concerns. Perhaps, then, the village of Feldheim and its 40 residential homes, church, community centre, and lack of shops and pubs, can serve as a beacon through the smog. Interested in environmental and energy policy? 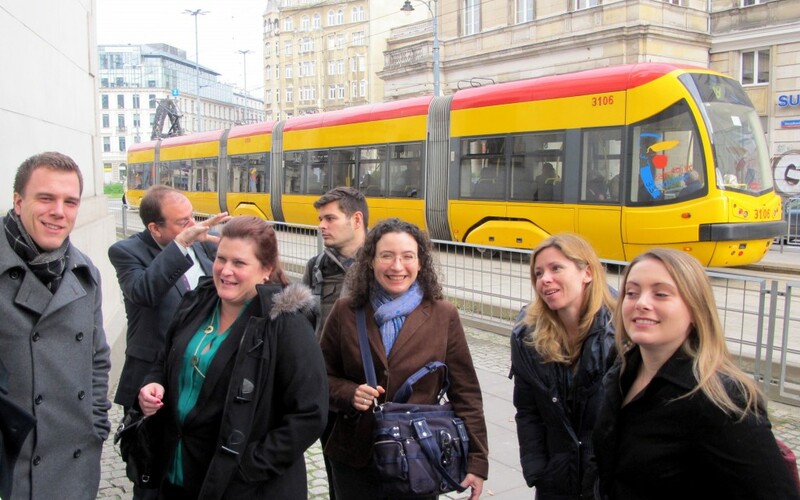 The Emerging Leaders in Environmental and Energy Policy (ELEEP) Network brings together young professionals from Europe and North America for study tours, conferences, and to establish a diverse and interdisciplinary network of relevant contacts. Former EGU Science Communications Fellow and ELEEP member Edvard Glücksman explains how he got involved and, as the network looks to expand, why EGU scientists should apply. ELEEP was launched in 2011 as a collaborative venture between two non-partisan think tanks, the Atlantic Council and Ecologic Institute, seeking to develop innovative transatlantic policy partnerships. 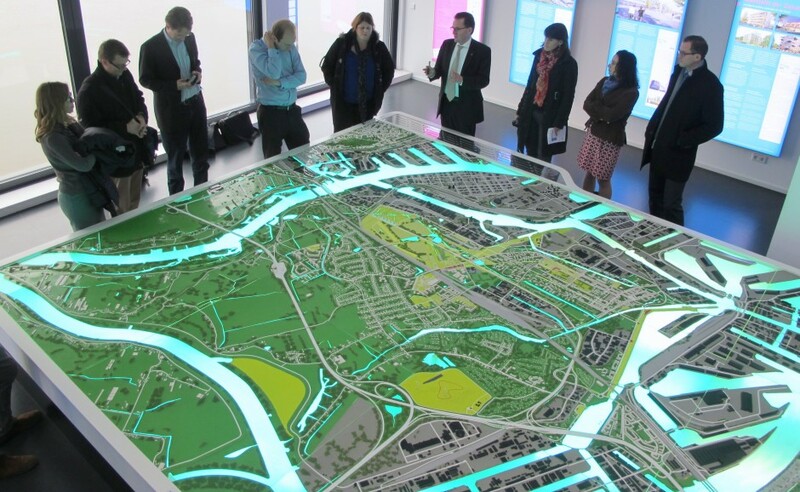 Funding was initially acquired from the European Union’s I-CITE Project and subsequently from the European Union and the Robert Bosch Stiftung. ELEEP has no policy agenda and no political affiliation. The day-to-day activities of the network take place within a closed Facebook group, custom built to log activity and allocate points to members according to the quality and quantity of their participation. Members post relevant content, including their own published work, news articles, and job-related information, as well as comment on the posts of others. Over time, more active members have a greater chance of being invited to the variety of face-to-face engagements that ELEEP has to offer. A study tour to the US Southwest, examining the water-energy nexus. I joined ELEEP as one of the group’s original members, having heard about the network on a visit to Atlantic Council headquarters in Washington DC shortly after its inception. The group offers me the opportunity to continue working with policy issues whilst at the same time conducting my everyday postdoctoral research. Moreover, ELEEP provides me with a unique social opportunity, putting me in touch with an inspiring interdisciplinary group of elected officials, legislative staff, businesspeople, academics, scientists, entrepreneurs, national security experts, urban planners, energy professionals, and journalists from both sides of the Atlantic, all with whom I maintain regular contact. My first trip with ELEEP was a study tour to Colorado and California, dedicated to exploring hydraulic fracturing and renewable energy, providing an American context to energy policy developments. I covered my journey through a series of posts on GeoLog, including about US renewables and the general state of affairs for energy policy in Colorado and California. Apart from gaining first-hand insight into some of the fundamental differences that underpin European and US energy policy, such as mineral rights legislation, I met some of my fellow ELEEPers for the first time, putting faces to the names I so often communicate with online. 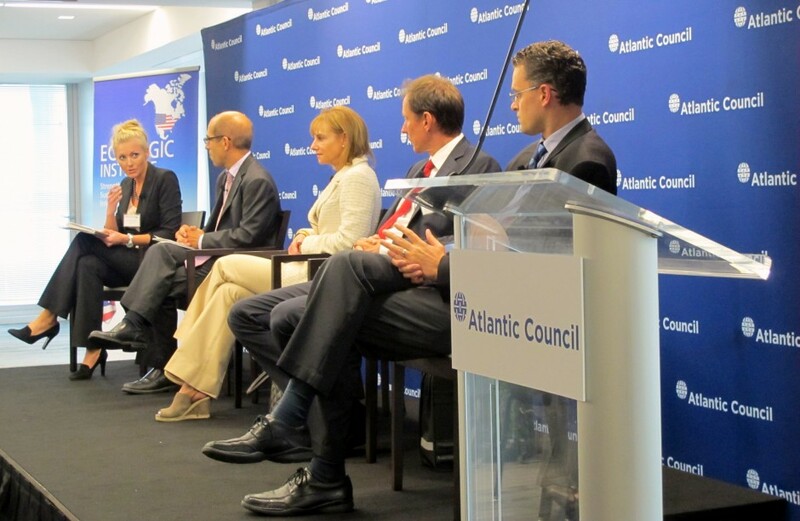 In addition, I was recently invited to attend the first ever conference organised specifically by ELEEP as a group, a session hosted by the Atlantic Council. There, I met many more of my colleagues and, apart from a one-day meeting featuring a range of expert speakers, we received professional communications training and attended a number of brainstorming sessions in view of developing future interdisciplinary collaborations. My next ELEEP trip will be in early November, to attend the United Nations Framework Conference for Climate Change (COP19) in Warsaw. ELEEP membership should appeal to all geoscientists with an interest in environmental and energy policy, in the broadest of terms. Those interested in joining are welcome to apply at any time; selection is competitive and made on a rolling basis. Further details and the application form can be downloaded here. 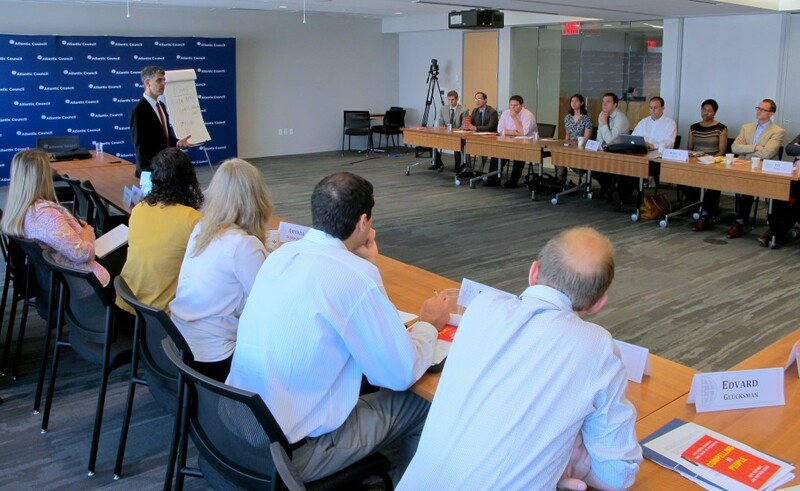 If you have any questions about the programme and the application process, please contact either the Atlantic Council’s Young Atlanticist Programme Assistant Director Daniel Bennett or Ecologic Institute Fellow Dominic Marcellino. Finally, please do not hesitate to email me with any informal questions you may have.